Earlier today, Marvel Studios kicked off their year-long 10th Anniversary celebration by unveiling an epic "class photo," that featured over 80 actors and filmmakers who helped shape the MCU throughout its first 10 years. The photo didn't feature every main star and filmmaker though, and one of the most notable exceptions was Clark Gregg, who played Agent Phil Coulson in Iron Man, Iron Man 2, Thor and The Avengers, before he was "killed" in that movie, only to be resurrected for the ABC series Agents of S.H.I.E.L.D., which is currently in its fifth season. Shortly after the class photo was unveiled, Clark Gregg took to social media, to reveal why he wasn't present for this epic photoshoot. "So sad I couldn't make this shoot. Honored to be part of MCU. I was proudly repping #agentsofSHIELD at #MadisonSquareGarden for @NY_Comic_Con @Marvel." Marvel also released a behind-the-scenes video, revealing that the photo shoot took place October 7, 2017 on the Atlanta, Georgia set of Avengers: Infinity War. That just so happened to be the same day that Marvel held their New York Comic Con panel for Agents of S.H.I.E.L.D., with Clark Gregg sharing a photo of himself and his cast mates at NYCC. Still, it would have been amazing to see Clark Gregg alongside all of the MCU heroes from the big screen. It's worth noting that, even though they are considered part of the Marvel Cinematic Universe, none of the stars from the Netflix TV shows Daredevil, Jessica Jones, Luke Cage or Iron Fist were part of the festivities either. The epic photo included stars such as Robert Downey Jr., Chris Evans, Chris Hemsworth, Mark Ruffalo, Scarlett Johansson, Paul Rudd, Benedict Cumberbatch, Chris Pratt, Chadwick Boseman, Brie Larson, Jeremy Renner, Tom Holland, Sean Gunn, Hannah John-Kamen, Zoe Saldana, Angela Bassett, Jon Favreau, Gwyneth Paltrow, Kurt Russell, Danai Gurira, William Hurt, Karen Gillan, Emily VanCamp, Tessa Thompson, Don Cheadle, Dave Bautista, Michael Peña, Anthony Mackie, Evangeline Lilly, Elizabeth Olsen, Paul Bettany, Frank Grillo, Letitia Wright, Laurence Fishburne, Linda Cardellini, Sebastian Stan, Ty Simpkins, Michael Douglas, Michelle Pfeiffer, Hayley Atwell, Pom Klementieff, Benedict Wong, Michael Rooker, Vin Diesel, Cobie Smulders, Samuel L. Jackson and Jeff Goldblum. Coincidentally, there was another noticeable absence from the movie side, with Josh Brolin not featured in the photo, which is strange since his character Thanos is ultimately responsible for all of these heroes uniting in the first place. While the official announcement and video revealed that this photo shoot took place October 7 on the Infinity War set, production wrapped on that movie in mid-July, just before the D23 Expo, although it's possible that the shoot actually took place on the Avengers 4 set, since filming began on that movie a month later in August. It's possible that Marvel stated that this reunion took place on the Infinity War set because they are still not ready to reveal the title for Avengers 4, which is said to be a huge spoiler for Infinity War. Regardless, it isn't very often that you get so many stars of this caliber under one roof together. 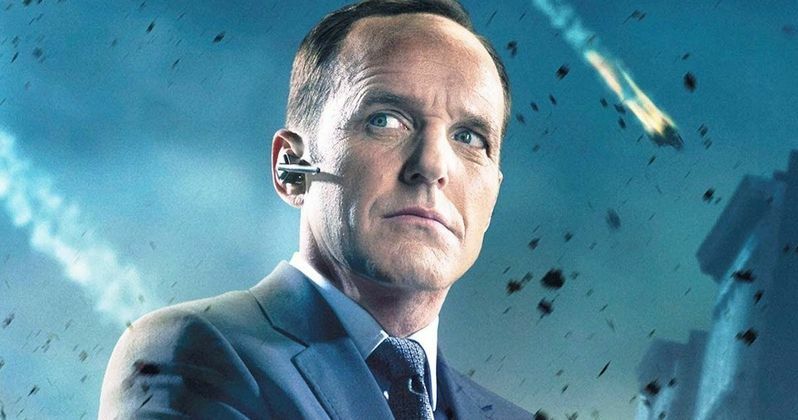 As for Clark Gregg, many have wondered if he will ever return to the movie side of the MCU, especially now that the S.H.I.E.L.D. organization has recently been legitimized on the show, after going underground for several years in the aftermath of Captain America: The Winter Soldier. The reveal that Agent Coulson has still been alive for the past six years would certainly be a memorable moment in the MCU pantheon, but we'll have to wait and see if Coulson will ever reunite with the rest of the big screen MCU heroes. Take a look at the tweet below from Clark Gregg Twitter, where he explains why he's not part of the MCU class photo.